Reese made a lot of developmental progress few months after she turned 3. First, she voluntarily gave up her feeding bottle, second, she is now semi-potty trained, and third, she can now draw simple objects, write letters, & our nick names (mine and hers). As she grows, we’ve noticed that she developed a mannerism while watching TV or by focusing her eyes on something. We initially thought that it was inherited from her dad, but later on decided to have her eyes check. 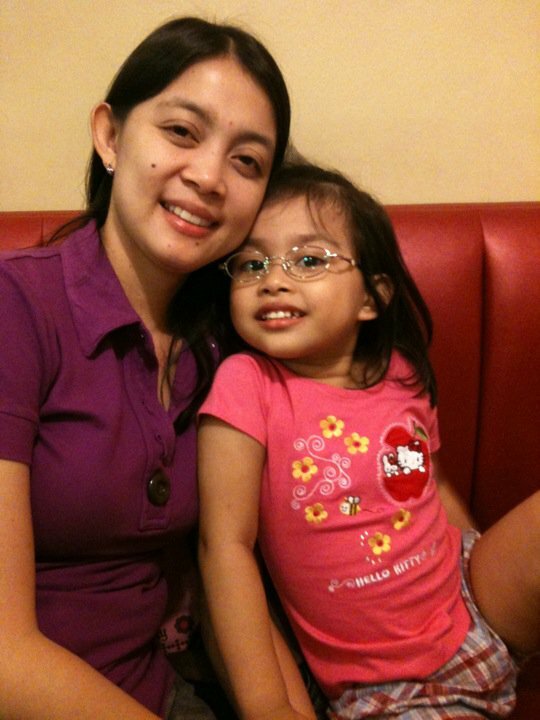 Last October 3, we brought her to American Eye Center in Shangri-La mall to have her eyes thoroughly checked. And my fears were proven to be right… the doctor said, she got astigmatism and a grade of 50 in both of her eyes. Aside from it, Reese was also diagnosed to be near-sighted, she cannot read too small objects from afar. I was really shocked and even though I was expecting that could happen, I find it difficult to accept it… Her dad and I were blessed with good vision, 20-15 which is even better than 20-20, and that I was really hoping Reese (of all people) will have the same blessing. It really made my heart sank. And up to this writing, whenever I ponder about it, I couldn’t help but to cry inside. After the check-up, we went to Vision Center to get the glasses for Reese. I was convincing myself that we have to follow the doctor’s advice for Reese’s own good. Reese, at her very young age of course, didn’t know what she was getting into. She gladly picked the Hello Kitty frame and happily wore the glasses. Seeing that she was comfortable and happy about it were my consolations… but still, I’ll be more than happy to give up my own good vision for her sake. Reese can take a break from her glasses during physical activities or when she doesn’t need to read something from a distance. At least, she’ll be able to play with the other kids without being bothered by the glasses. Now it's time for me to move on... it will surely take awhile, but hopefully, I'll get there. To Reese, we'll make sure that you'll feel comfortable and that you will always get the kind of glasses that you need, we love you so much!